02 Aug 2016, Tuesday. I woke up this morning feeling a little frustrated with myself. I left my original iPad charger and lightning cable in the serviced apartment in Samut Sakhon. So I’m one USB and one lightning cable less for the remaining of this trip. Thankfully, I brought spares – as keeping my iPhone charged is very important to me. It’s not only a phone, but also a GPS, internet device, currency exchange calculator, messaging device, hotel booking apparatus, weather forecaster, language translator, and possibly another 1,001 other uses. You can tell that my iPhone is probably the next most important tool after my motorcycle itself. After iron butting my way down south to Surat Thani, and with really nothing too much to explore around here, I headed to the nearby ferry pier to make my way to Koh Samui – a very touristy island on the southern side of Thailand. The journey from Surat Thani to Don Sak took about an hour. Ferries run from Don Sak to Koh Samui every hour on the hour. I headed to the Raja Ferry pier as during my (very quick and very limited) online (iPhone) research, Raja Ferry had the most complete information and transparent pricing on their website. 220baht for the crossing for the motorcycle including the rider. Not exorbitant at all for the 1.5hr ferry ride. I reached Raja Ferry pier just before 0730am, and was planning to catch the 0800am ferry. Obtaining the ferry ticket was painless – paid 220baht at the ticket counter and rode into the pier. 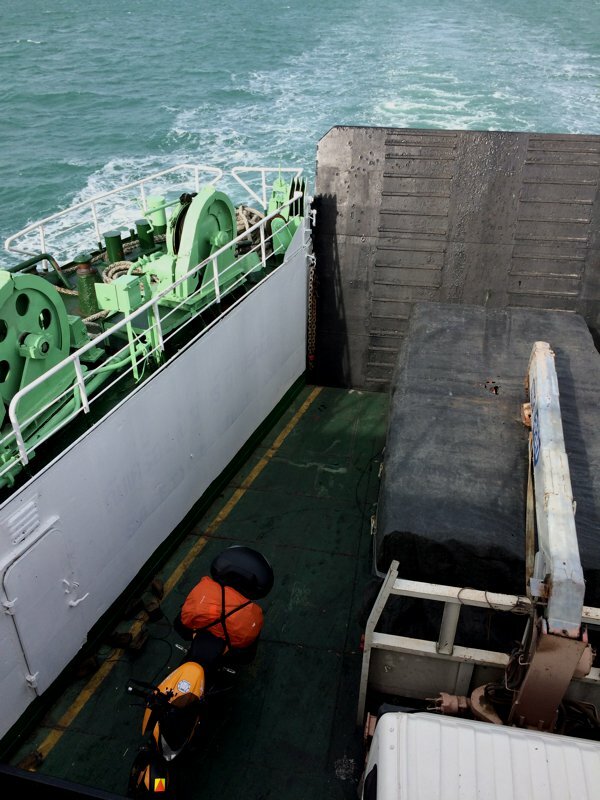 Funnily enough – although the ticket counter girl told me that the “next ferry” was at 8am, it seem like the “previous ferry” was still around and was just about to leave. 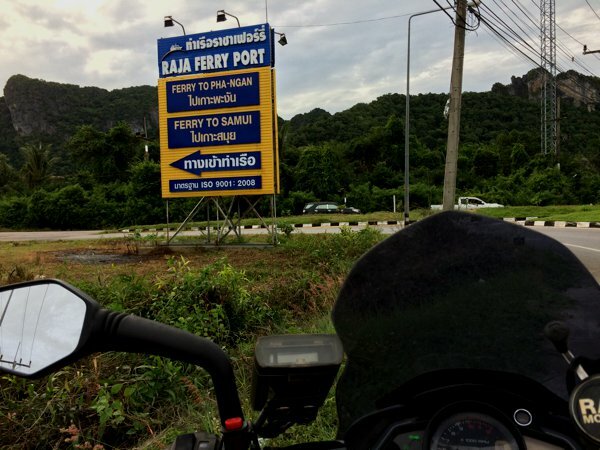 As I was directed to board the ferry and ride through the ramp, I kept repeating “Koh Samui? Koh Samui?” You see, the same pier and ferry company also operates to the other nearby islands of Koh Pha Ngan and Koh Tao (I think). So I wanted to make sure I was getting onto the correct ferry. Thankfully, I received nods of acknowledgement from the ferry staff. I think I was the very last vehicle to board the morning ferry. Boarding the Raja ferry to Koh Samui. 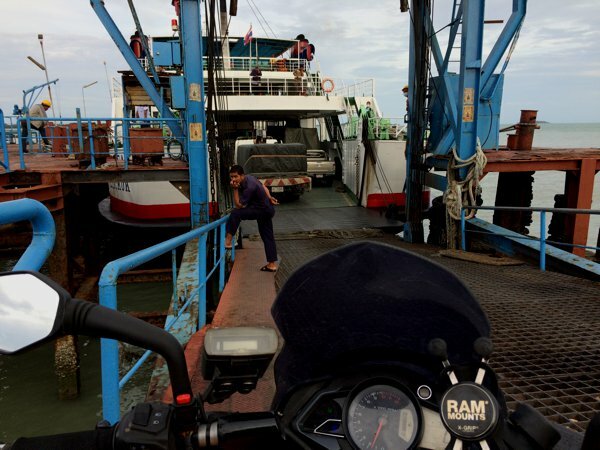 The Raja Ferry from Don Sak to Koh Samui left the pier at approximately 0730 and took exactly 1.5hrs. Since it was so early in the morning, I was probably the only tourist on board the ferry. 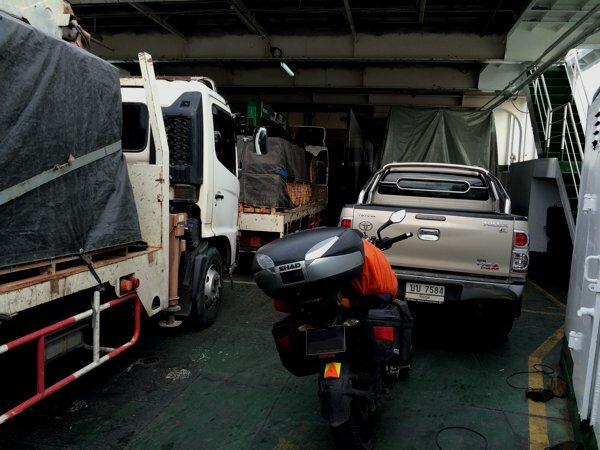 The other vehicles in the vehicle bay seem to be work vehicles – trucks carrying workers, materials and supplies to the island of Koh Samui. Even the locals on board seem to be workers and not local holiday makers heading to Samui. Vehicle bay in the ferry was full of work vehicles. 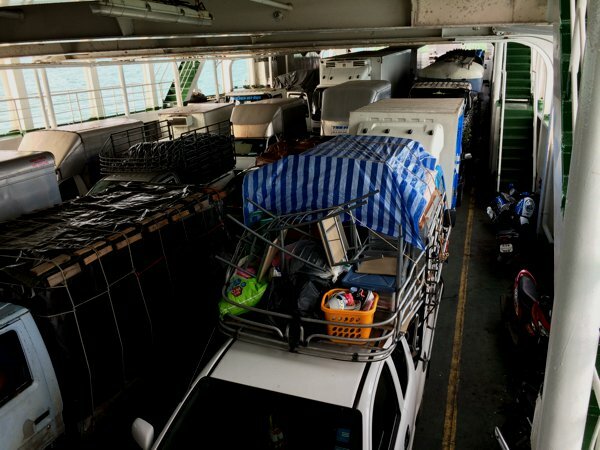 Another view of the vehicle bay on the Raja Ferry to Koh Samui. Last one onto the ferry. Koh Samui, here I come! Surprisingly, I had good 3G internet connection throughout the journey, and so I took the opportunity to do some research while on my way to Koh Samui. Koh Samui is one of the larger Thai islands in southern Thailand. It’s quite big actually – about half the size of Singapore. Famous for its beaches and full moon parties, it’s one of the favorite destinations for tourists and almost self sufficient on its own. It has its own airport, hospital, and even a court and an island jail. 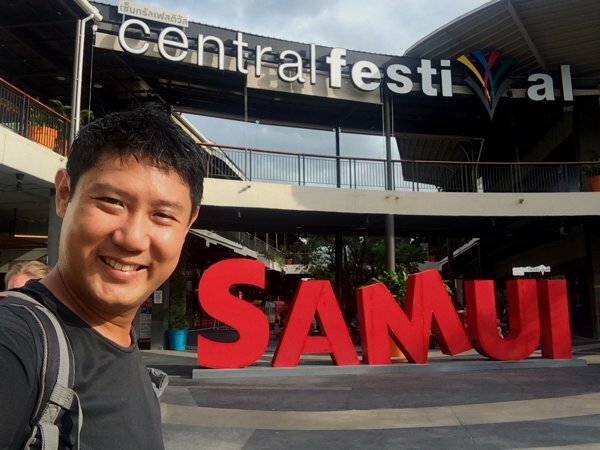 I saw car and motorcycle dealerships selling brand new vehicles and real estate outfits selling Samui properties. There are also schools and other municipal offices. So it’s not just a tourist island, but locals born and breed here too! The more popular beaches in Samui are the Chaweng Beach (north east of the island) and the Lamai Beach (south east of the island). There is a ring road that circles the island of Samui and most places seem to be not too far from the main ring road. 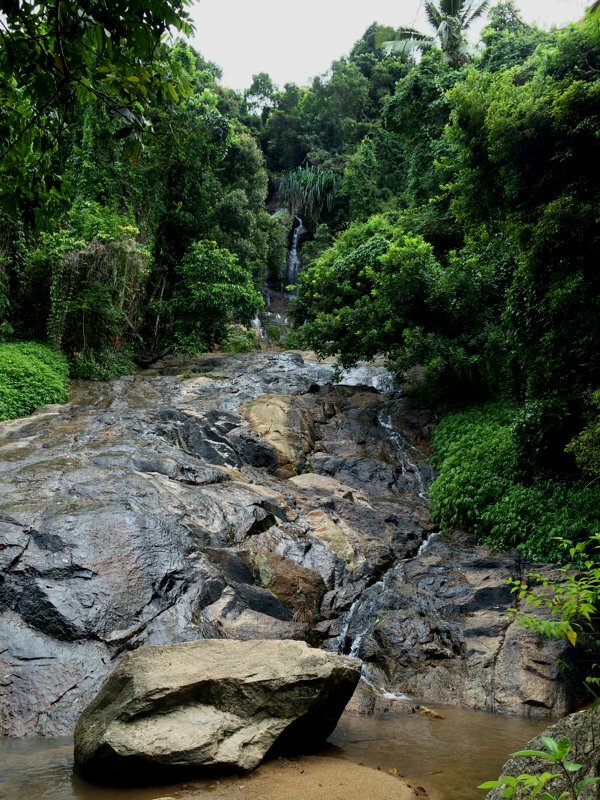 The middle of Samui are highlands and forested and have some natural attractions like waterfalls and viewpoints. Most stuff on the islands are found around the circumference, near the beaches of Samui. I punched into my GPS the coordinates of the Tourist Information center in Chaweng, and made my way there upon disembarkation. Along the route, I saw a turn out to Namuang Waterfall. Since it was still early, I decided to go explore a little. 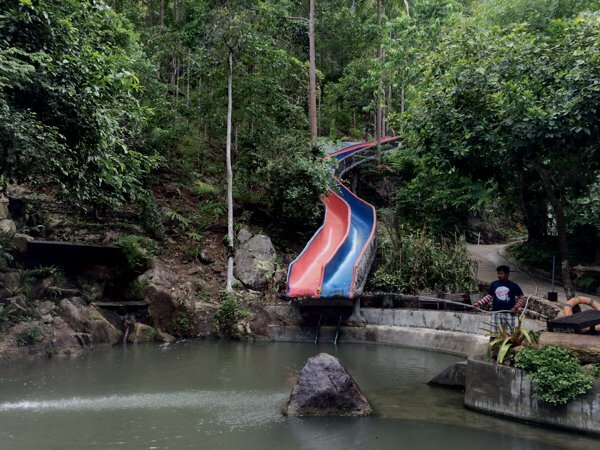 They do have a waterslide here though… Maybe because it was still very early (9’ish in the morning), I didn’t see anyone playing here. The Singaporeans in Samui group shot. The hotel staff who took this picture didn’t manage to include the other 2 more Singapore-registered bikes. 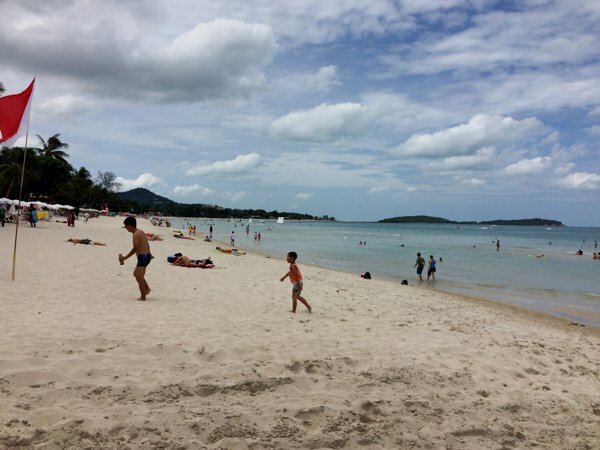 Samui is all about its beaches. I spent some time frolicking along Chaweng Beach. Headed to the nearby mall for some air-conditioning, not retail therapy. I didn’t get anything more than 2 packets of snacks and 2 packs of coconut juice. When I entered Central Festival mall and was looking for a place to park my bike, I was shoo’ed away from the normal motorcycle parking area. Interestingly and perhaps because I had my top box mounted, my Pulsar 200NS was considered a “big bike” and I was ushered to the “big bike” parking area in the VIP parking section. I felt so privileged! LOL! 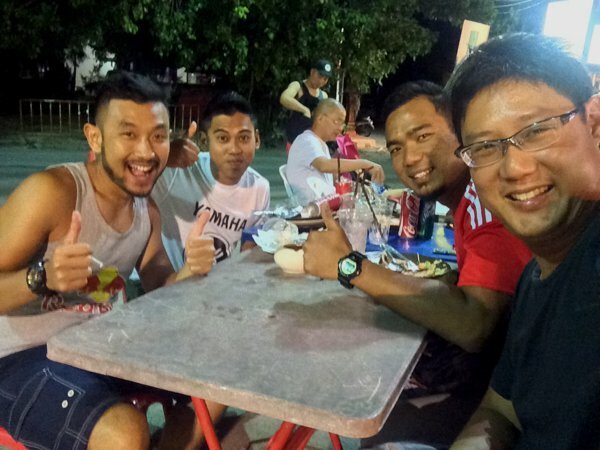 …the same group of Singaporeans! Incidentally, the hotel I eventually got was a mere 30 steps away from where they stayed. They invited me to join them for dinner, but I was too full as I just had mine minutes ago. So while they had their dinner, I sat around and chatted with them. I found out that they were all experienced riders and have arrived Samui the day before. They will be heading to Trengganu, Malaysia the next day. 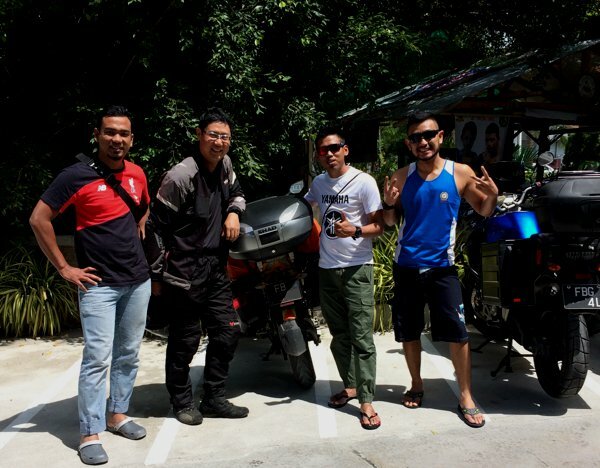 Meet Zairul, Fariz and Ariff who rode their big bikes up from Singapore! It’s always nice to meet Singaporeans on the road. And it’s always very nice to meet fellow riders on the road. Have a safe trip back home guys! We’ve safely reached Singapore! Be safe brother, was an honor to have met you at Samui, of all other places! hi which hotel did you stay at koh samui? I couldn’t recall the name of the accommodation, but it was one of those many inexpensive boutique hotels in front of the dive shop – Silent Divers.